Last night we baptized Jane Ellis in our home. 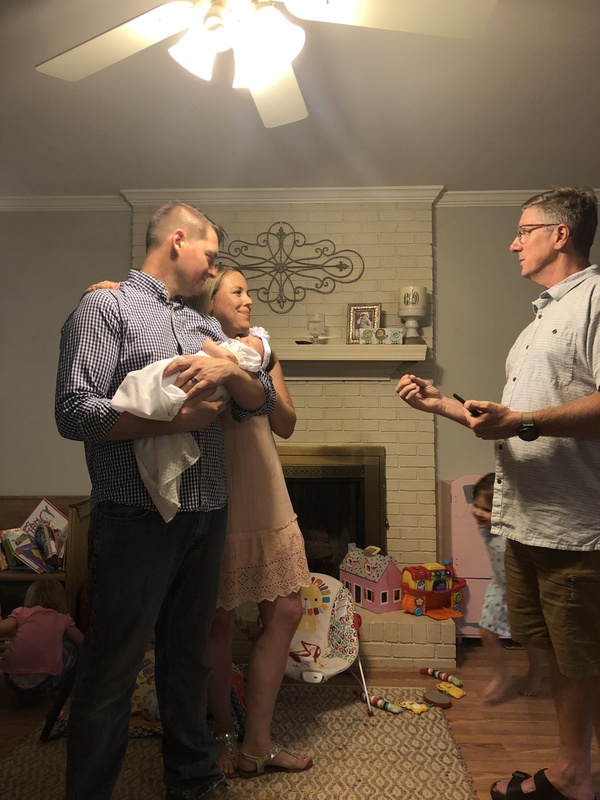 We started this tradition with Nora Beth, and it’s been incredibly moving to see each of our three treasures dedicated to the Father within the walls of our house. It brings, to me, an even holier weight to the work we’re doing to provide them with sanctuary, comfort, peace, learning and structure. We were surrounded by an intimate group of some of our most beloved people. 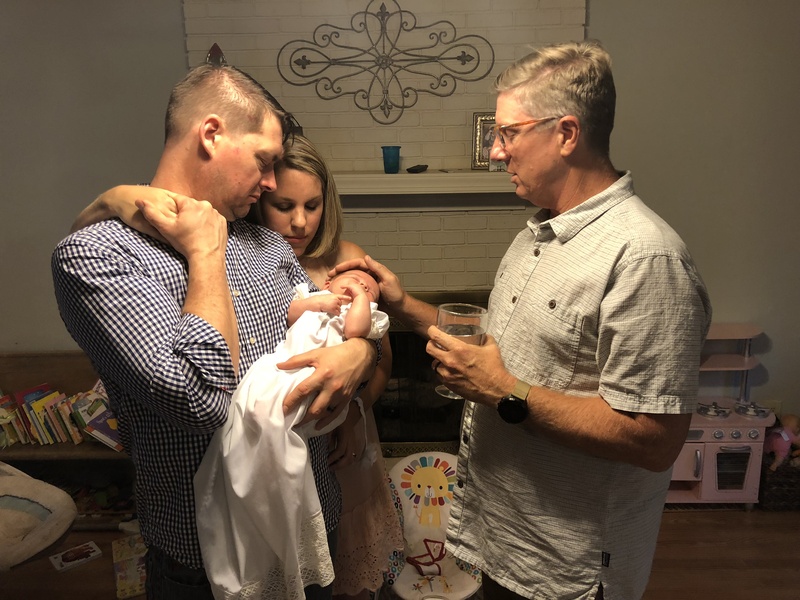 David led us in a prayer, I read a love letter I wrote to Jane Ellis and those assembled, and our local pastor reminded us that the night was not about Jane Ellis, but rather about us committing to raise her in God’s truths. While he spoke, Nora Beth and Annablair run amok… overstimulated that all of their very favorite people were gathered in one room. Alan reminded us of the beauty of that chaos, and we couldn’t agree more. After baptizing her with a sprinkling of Matthews finest tap water, we broke for snuggles, simple snacks, cake, wine and sparkling water. Below are a few pictures from the night and the letter that I wrote for our darling girl. 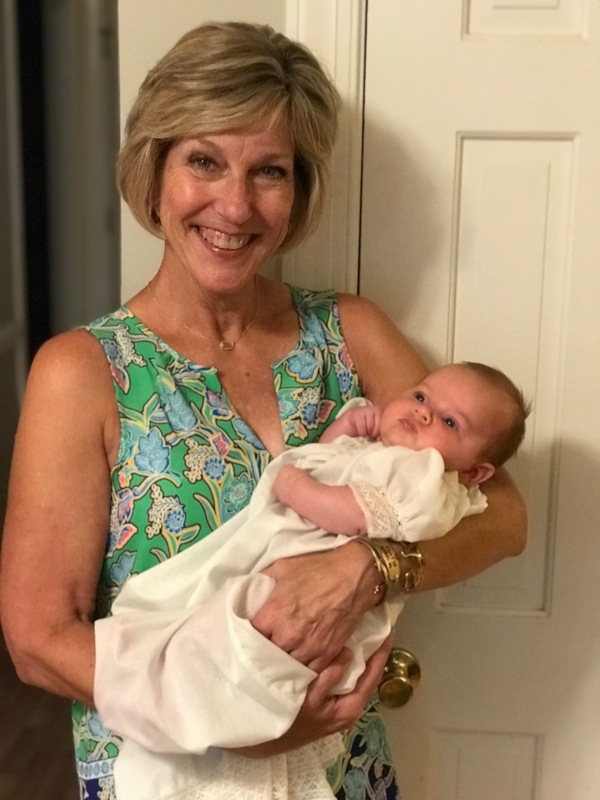 Our darling Jane Ellis is almost 8 weeks old, and in that short span of time, she has dazzled us in every way. But her story begins before that. The first lesson you ever taught me, Janiecakes, was not to take a pregnancy test at work. Also, you called into question why one drives around with pregnancy tests in their car. It’s only fitting that Alison learned our news only hours after. The hours during which I insisted David not tell her, because with the chance to truly surprise people, we should take advantage of it. When she benignly greeted me after work with a simple, “how was your day?” I folded like an origami crane. “Uhhh I found out that I’m pregnant.” I broke my own rules. Your second lesson was that the rules and expectations matter very little. It’s impossible to harness unadulterated joy. It wouldn’t be super appropriate to share the reactions of Alan and Nina in this holy moment. But they were identical. And one is captured on film. They both, fittingly enough, include the word holy. The third lesson you taught us, Jane Ellis, is that bad words can be very very good. For several months, though, you weren’t Jane Ellis. You were proudly Patterson. 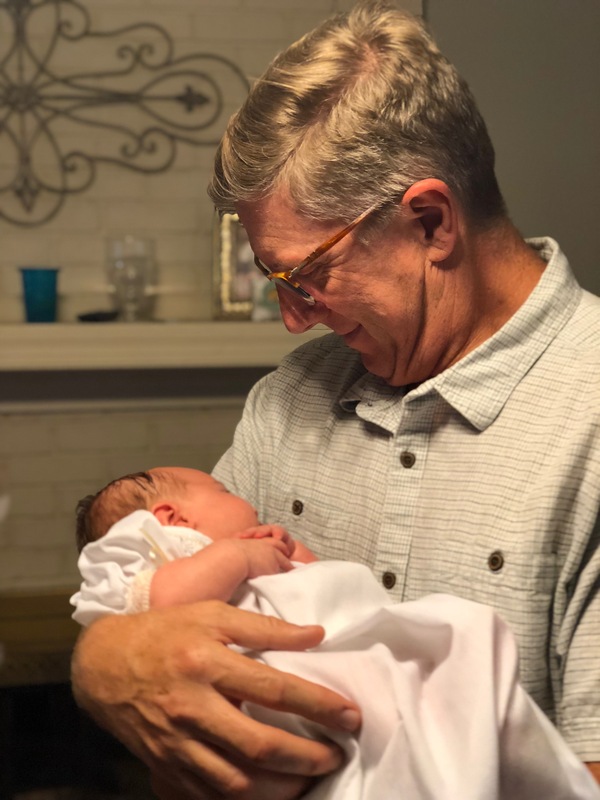 Named after the man who baptized your sister, glued your mama back together when things were not good, who, by admission, doesn’t love children, but somehow lavishes you with it, and who is the most wonderful dad to me. Unfortunately, though it was well-meaning, a family member sort of wrecked that for us. Whoops. Your fourth lesson: if you loved it, then you shoulda kept a lid on it. When she isn’t calling you Janiecakes or Jane Ellwis, your biggest sister calls you Janie P, and I think God is winking at all of us, since we consider your middle name to be Patterson honorarily. Fifth lesson: three double names is fine. Four names is too many. You’re welcome. There is one lesson that your other sisters taught us… no one loves more purely than the Lapinskys. You may not have cousins yet. Your extended family’s ranks may be thin, but there are eight who fill the gaps wholly and surely. And a mama to those eight who is a beacon of assurance to us. Who celebrates with us. Who soothes our sad hearts. Who commiserates with us during strained times. Who is so much more than we asked her to be. You are Ellis because of Alison. All three of you are becoming who you are because she has a hand in it. 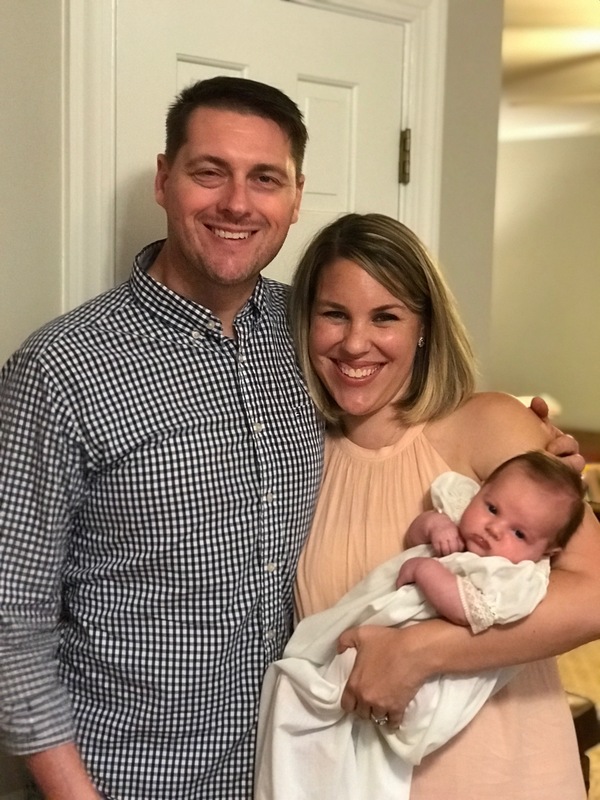 Since you joined us on June 20th after weeks of contractions, false starts and second guesses, you taught me something profound… there is no need to question. You are ours. Oh, sweet angel, you are most definitely ours. There is nothing so beautiful as watching Nora Beth and Annablair, quite literally, smother you with love and affection. You patiently and quietly endure pacis being shoved into parts of your face that they aren’t meant for. You stalwartly accept snuggles, kisses, and the stray knee or elbow. You have awoken Nora Beth’s most tender side and given the sweetest outlet for our precious wrecking ball’s paths. Thank you. More poignant than any of this, though, is that you are your daddy’s redemption song. He has fought so courageously through demons unspoken. And he has emerged as the leader, partner, father and protector we saw all along. You helped teach us this, already, my love: demons are heavy. But legacies are worth dropping them for. The angels we’re given are worth soaring for. It is no accident that those in this room are here to help us dedicate you. My prayer is this… that you would know unity like the Lapinskys. That you would experience the grandpaternal humor, purpose and lightheartedness of Alan. That, when you’re ready, you would hold tight to grace like your daddy. That you would be imprinted with the grit, tenacity and fiery not-going-down-this-way spirit of your Nina. And that I would be able to teach you just a fraction of what you’ve already taught me. You are ours, Jane Ellis. But foremost you belong to the Creator who gifted you to us. Let there be this for all of your days… a foundation of joy, strength, resilience, and most of all love.